Looking for a side dish to compliment your meal? 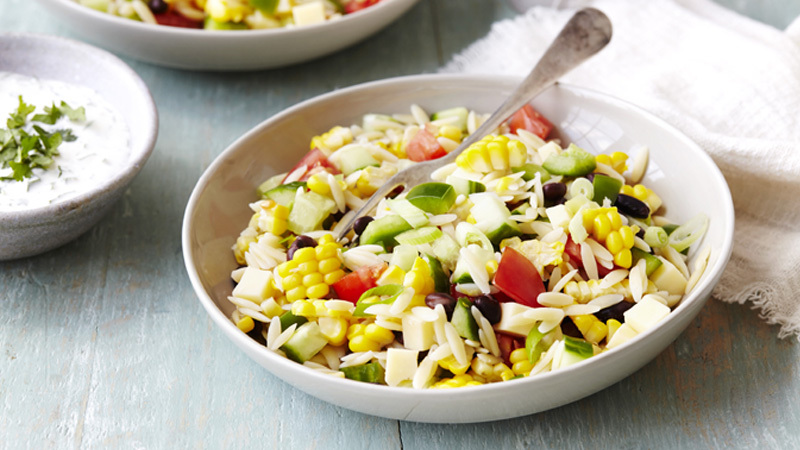 Serve this delicious salad made using pasta, Old El Paso™ Black Beans and veggies. 1. Cook the pasta in a large saucepan according to pack instructions. Adding in the sweetcorn for the last 5 minutes of cooking time. Drain and rinse with cold water to cool. Drain again. 2. Combine all the remaining salad ingredients in a large bowl. Combine all the dressing ingredients in a small bowl and mix well. 3. Cut the corn from the cob with a sharp knife and add to the salad. Add the cooked pasta and mix well. Pour in the dressing and mix well then serve. Stir through some salad leaves such as watercress, rocket or spinach and serve as a main course rather than a side dish. Prepare this salad in advance, cover and chill in the refrigerator for several hours. Just before serving, check to make sure the salad is creamy. Stir in 1 to 2 tablespoons of milk if the salad seems dry.